*Image from book's Amazon page. Tara considers herself a normal teenage girl. She attends high school, has a group of friends (and a mortal enemy) and her biggest struggle is convincing her boyfriend, George, that they're just not right as a couple. Then, as these stories go, something strange happens. A violent something strange. She sees a woman turn into a wolf and gets attacked. Tara accidentally kills the wolf and it turns back into a woman. That's when Tara meets others. People who show her that she is actually from a long line of Hunters and she is woefully unprepared for her future as a new target of the Werewolves. When I first started reading this book, I was very afraid it was going to be another Twilight (pretty "meh" definitely not my thing). What I got, instead, was much more of a Buffy the Vampire Slayer kind of story. Tara does have some stereotypical weepy teenager moments, but overall, she's pretty strong and relatively smart. The best part of this book, for me, was the cast of characters. Every character felt like they had so much of their own story to tell. I especially wanted more pages given to Jack and Fee. Hopefully the next books in the series do give them more time. It was especially fun to see the different personalities and their dynamics as they worked together. My favorite moment was when Tara's grandmother came into the picture. Everyone in this fight is (pardon the language) badass. 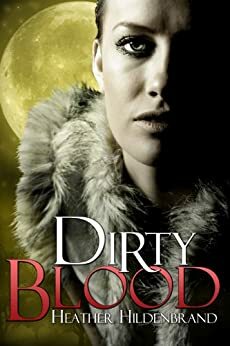 So, despite my general dislike of YA Supernatural Love Stories, I genuinely had a good time with Dirty Blood. While the romance is, sometimes, painfully at the front of the story, the overarcing story of the Hunters vs the Werewolves vs the Council is incredibly interesting. This world is rather engaging and I'm strongly tempted to pick up the next book in the series to see how much of the world gets expanded on. If you like YA Supernatural books, this is a good one to pick up. It only has Werewolves and Hunters (so far) but it has a good amount of action and a nice level of intelligence.